We bring forth to our clients with a wide variety of Bed Mattresses that are filled with natural and non toxic material like straw and feathers. The average person spends about one-third of their life in bed, but we were surprised to find how little scientific research has been performed on mattresses, and how few experts make specific recommendations. The best mattress is a matter of personal preference. You can choose any model from our two leading brands of mattresses i.e. Orthomedical the posturepedic mattress and Deep sleep the tempur-pedic pressure relieving mattress. These are comfortable & stylish and provide great sleeping pleasure. mattresses provided by us are light in weight & durable and are available in various colors, designs and patterns. 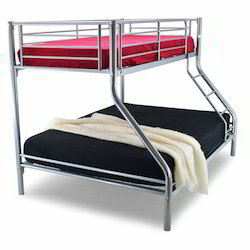 A Bunk Bed is a type of bed in which one bed frame is stacked on top of of another, The nature of bunk beds allows two or more people to sleep in the same room while maximizing available floor space. This leads to them being used in places with limited floor space, such as ships and in army garrisons or in places that wish to maximize bed space such as Summer Camp, Hotels, Children Room etc. Looking for Mattresses and Home Comfort Products ?